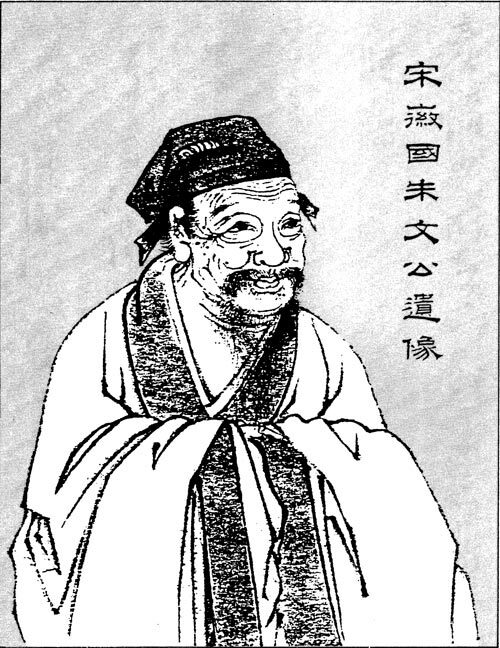 Zhu Xi (1130 - 1200), also known as Zhuzi,3 was a major Song dynasty philosopher and commentator, but at the time his ideas led to his being dismissed several times from official positions. 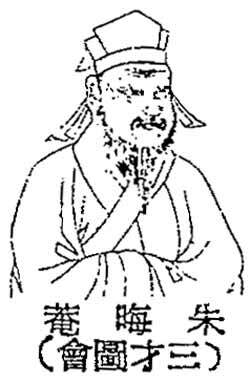 His father Zhu Song4 (1097 - 1143), a scholar and high official, also had problems with the government, in his case due to his opposition to peace with the Jin, as a result of which he retired. Connections between Zhu Xi and specific guqin melodies are all tangential. For example, his commentary on the Da Xue is included with the qin melodies Mingde Yin and Kongsheng Jing.10 And Shuangqin Shuwu Qinqu Jicheng (1884), in its preface to Shishang Liu Quan, connects Zhu Xi to the melody Bijian Liu Quan (see also the Zha Guide). Most or all of Zhu Xi's writings were collected into a compendium called Mr. Hui'an Zhu Wen'gong's Literary Collection.11 Works from this collection that concern guqin are discussed further below. Dr. Tong says that this work, already mentioned above, is very abstruse and he invites the readers to consult the original! Folio 20B, #64 - 67. 14779.803 朱熹 Zhu Xi, 字元晦 style name Yuánhuì, 號 晦庵 nickname Huì Àn, commonly known as 朱子 Zhuzi: Master Zhu. 5. 尤溪 Youxi, in central Fujian province. 7. Wuyi Shan 武夷山 has a number of buildings commemorating Zhu Xi, including his grave and a memorial hall. On Mount Lu (廬山 Lushan) in Jiangxi province. Today a landmark, there is apparently a plaque on 五老山 Wulao Shan (Five Elders Peak) commemorating the spot of the academy. 10. There is no suggestion that he had any connection with the music. This is the full title, e.g., as found in the China Text Project, of the Collected Writings of Zhu Xi (14281.33 晦庵集 Hui'an Ji: 100 folios, with a continuation in 11 (5?) folios and extra essays 10 (7?) folios. The selections in Tong Kin-woon's Qin Fu, pp.1690-1, are from folios 1, 4, 66 and 85 (see following footnotes). His comments are on pp. 1738-9. I do not yet know of any available translations. Tuning the Strings (調絃 Ding Xian, 310-16). There are a few differences in the text - corrected here from the standard version. Symbols such as 厶 and マ seem to be a shorthand for pitch names; none is in standard use for qin tablature. 太史公五聲數曰：九九八十一以為宮（散聲）。三分去一，得五十四以為徵（為九徽）。三分益一，得七十二以為商（為十二徽）。三分去一，得四十八以為羽（為八徽）。三分益一得六十四以為角（為十一徽）。十二律數曰：黃鐘九寸，為宮（琴長九尺而折其半，故為四尺五寸，而下生林鐘）。林鐘六寸為徵（為第九徽。徽內三尺，徽外一尺五寸。上生太蔟）。太蔟八寸為商（為第十三徽。徽內四尺，徽外五寸。下生南呂）。南呂五寸一分為羽（為第八徽。徽內二尺七寸，徽外一尺八寸。上生姑洗）。姑洗七寸一分為角（為第十一徽。徽內三尺五寸，徽外九寸，下生應鐘）.... These calculations give precise positions in terms of the overall length of the qin strings. 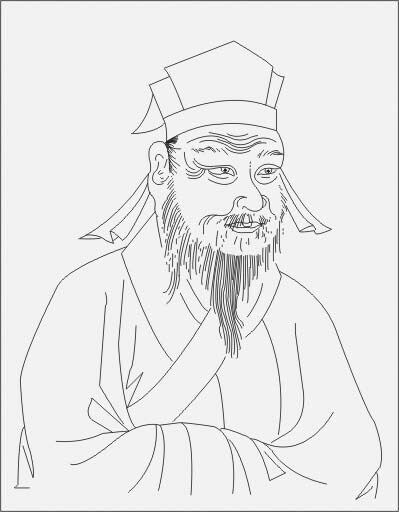 Later on, in an essay entitled "Qin Precision Measurements" (琴準異同 Qin Zhun Yi Tong; QQJC, p. 18), Xilutang Qintong had similar calculations, but giving the positions in terms of their distances from qin studs. However, both of these works give positions in terms of physical distances (e.g., inches), not decimal percentages (e.g., 7.6), and neither work seems to have suggested that these mathematical relationships could be used for indicating finger positions in qin tablature. These calculations are discussed by 李玫 in 《琴律說》文本解讀——兼及常見的校勘錯誤，音樂研究 2008, 第5期 (thanks to Tse Chun Yan for the references). There is also further comment on this under Origin of the modern decimal system for indicating finger positions. Not clear whether the poem is associated with a particular melody. Dr. Tong says, "內容深奧，而所論非詳解不能明白". It is one of the 雜著 Miscellaneous Writings; further details above. There is no index for this book, so I may have missed some selections. As for the twelve songs, Zhu Xi noted that they were not in the style in his time, and that they were cited from a collection made by one Zhao Yansu 趙彥肅 (ca. 1170), who claimed that the songs dated back to the Kaiyuan (713-741) period of the Tang.... Whatever the origin of these twelve ritual songs, it was Zhu Xi who provided a precedent for countless similar musical compositions by later Confucian musicians.... Zhu Xi's settings were later included in the qin handbook Lüyin Huikao together with several others, including qin and se settings (details below). Lüyin Huikao includes Zhu Xi's transcriptions of song settings for 12 Shi Jing lyrics. The songs are said to date from the Tang dynasty but their earliest survival is from their publication in 風雅十二詩譜 Fengya Shiershi Pu (ca. 1170, see above) by 趙彥肅 Zhao Yansu (QQJC XXII/171-8; various additional transcriptions is in an appendix, pp.179-209). Zhu Xi himself did the transcriptions into lülü notation; modern transcriptions into staff notation include those mentioned above by Pian and Picken. In addition to this publication in Lüyin Huikao these songs were apparently later published in Qinzhi Shen Qiu (1889; not in QQJC). As far as I can tell these latter were developed from/copying the Lüyin Huikao settings. There is further mention of 邱之稑 Qiu Zhilu's work in Pian (pp. 154-173 and search for "Chiou Jyluh"). She includes (p.166) a transcription said to be by Qiu himself of Guan Ju (q.v. ), but her practice of not including the original notation makes it difficult to know where it is in Lüyin Huikao. My own understanding of this is minimal. From looking at the original lülü notation it seems there are no ornamentation or rhythmic indications, just one note name for each character of the lyrics; they would thus seem not to have been designed for any particular instrument. I also do not know whether the 19th century qin tablature arrangements might give some hints at the then current rhythmic understanding. The reference given is 宋史 the official Song dynasty history.